Andrea Horwath speaks to supporters in Kitchener on Tuesday, May 15, 2018. Health care was the focus of Andrea Horwath’s stop in Kitchener on Tuesday. 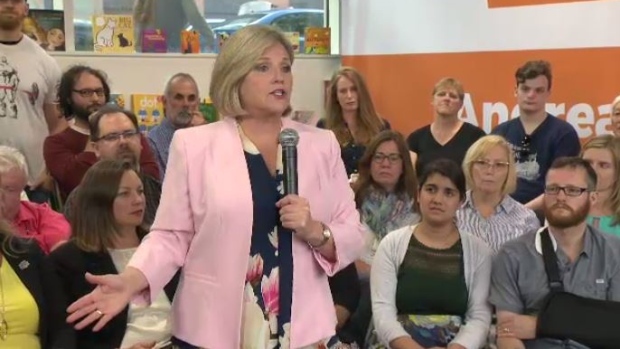 The NDP leader talked about issues ranging from hospital overcrowding to long-term care to mental health services as she spoke in front of a crowd of supporters in downtown Kitchener. 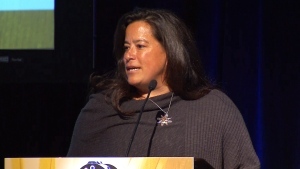 On long-term care, she said 32,000 Ontario residents are currently on a waiting list for space in long-term care facilities – a number projected to grow in the near future due to demographic trends. “We have a long-term care system that’s not meeting the needs of our most vulnerable and treasured seniors,” she said. Horwath said the NDP plans to add 40,000 long-term care beds to Ontario’s system over 10 years, if elected, and mandate that all patients must receive four hours of hands-on care per day. “That’s the kind of humane care that we need to bring to long-term care,” she said. 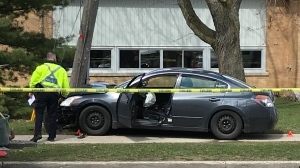 Horwath also touched on the case of Elizabeth Wettlaufer – a nurse who killed eight patients at long-term care homes in Woodstock and London. The NDP has been pressing for a public inquiry in the case to be expanded to cover all facets of the long-term care system. Horwath vowed that if she becomes premier, the inquiry’s scope will be increased within 100 days.